Palamedes Swallowtail: One photographed on Thermal Trail, 19 August by “Madam X” was a Lancaster Co. record which filled in a gap in the species range in Northeast South Carolina. Checkered White: There were 4 reports this season: 16 June, 8 along Hy 601 near Ft Motte, Calhoun Co., a known location (Dennis and Donna Forsythe); 7 July, 3 near Radcliffe State Park, Aiken Co., a known location (Dennis Forsythe); 13 November, 1 on the Laurel Hill Wildlife Drive, Savannah NWR, Jasper Co. a new location but not a county record (Elizabeth Anderegg); and 9 August, 1 on Wire Road near Carolina Sandhills NWR was a new county record (Will Stuart). Great Southern White: There were 2 records of this southern visitor this fall: One seen by Sue Farnsworth at Hobcaw Barony, Georgetown Co. on 1 September during the Hobcaw Barony NABA Count; and 3 seen 27 September at Point of Pines Road, Edisto Is, Charleston Co. by Tom Austin. Large Orange Sulfur: A male observed at Holy Cross Cemetery, James Is on 17 November by Dennis Forsythe, was only the 4th record for South Carolina and a 1st for Charleston Co.
Great Purple Hairstreak: Will Stuart observed one at the Carolina Sandhills NWR, Chesterfield Co. 8 June and Dr. April Gordon photographed 1on Taw Caw Drive, Clarendon Co. 10 September. King’s Hairstreak: An individual photographed by Tom Austin on 26 May at Roxbury Park, Charleston Co. was new for the park. 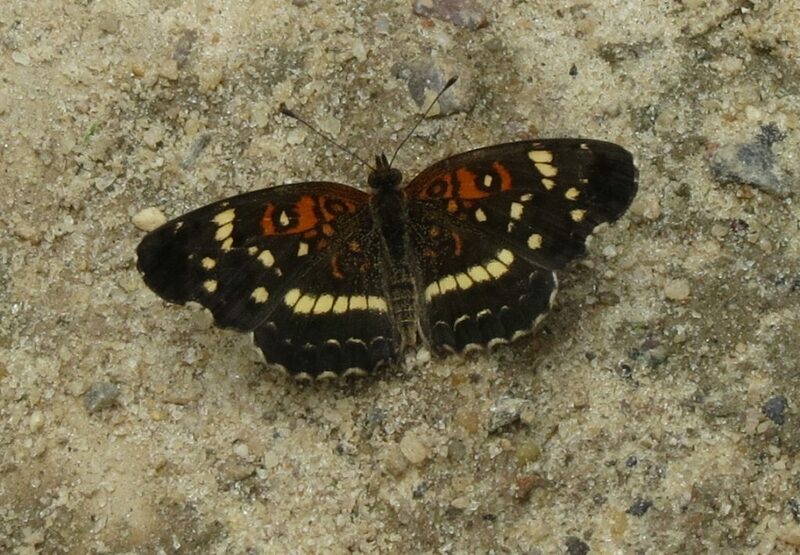 One photographed by Will Stuart at pool A, Carolina Sandhills NWR on 10 June was new to the refuge and Chesterfield Co. Dennis Forsythe had a worn individual 3 June on Chinquipin along Hy 41 at a known location in the Charleston Co. section of the Francis Marion NF and Bob Dellinger had 2 at the same location on 5 June. Summer Azure: One photographed by Carolyn Seaton 17 August at Indian Lands was a Lancaster Co. record, leaving only Marion County without a record for this species. Zebra Longwing: There was not large scale irruption of Zebra Longwings like we experienced in 2017. The first report for this year was 1 photographed by Dennis Forsythe at Santee Delta WMA-West on 2 September during the Francis Marion NF NABA Count. Donna Forsythe had between 1-3 individuals at 748 Swanson Ave and vicinity, James Is, 3 September- 2 October. Peter Strangel had 1 at his house in Aiken, 12 September. Tom Austin had 1 on 26 July on Edisto Is. One was photographed by many on a Savannah NWR Butterfly Field trip at the Cistern Trail, Savannah NWR 29 September and lastly Peter Strangel had 1 on the Laurel Hill Wildlife Drive, Savannah NWR 1 October. Diana Fritillary: Notable were 2 females on 23 August and 1 female of 24 August along the Spy Rock (FS 748) Road, in the Oconee Co. section of the Andrew Pickens District, Sumter NF, a new location for this uncommon species. Painted Lady: After last year’s widespread occurrence, there are only 3 sightings this year. One photographed 29 October at Pine Is, Santee NWR by Chris Snook, 1 seen at Doko Meadows, Blythewood by Marty Kastner and 1 photographed by Dennis Forsythe 3 November at the BP Station, Santee, SC. Texan Crescent: There were 5 reports of this species this season: Dennis Forsythe had 1 on 17 July along Gum Swamp Road, Aiken Co. ( a new location) and John Demko had 3 along the same road 14 July; Elizabeth Anderegg photographed 1 on 18 October and Dennis Forsythe photographed 1 on 30 October along the Savannah River Trail, Webb Wildlife Center, Hampton Co., a population first reported by Jacquie and Brian Penny this spring. Marty and Dave Kastner had a single individual along the Timmerman Trail, Cayce, Lexington Co., 13 October. They had 1 in almost the same location 21 October 2017. Creole Pearly-eye: One was reported from a usual location Silver Bluff Audubon Sanctuary, Aiken Co., 1 June (Peter Strangel); 6 were seen at Congaree NP, Richland Co. 25 July (Tom Austin & Alison Smith) and 1 was photographed 23 August on FS 748 Rd, Oconee Co. (Dennis Forsythe). 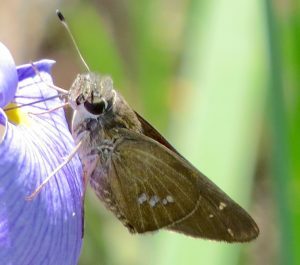 Gemmed Satyr: This common species was reported from Charleston, Georgetown and Orangeburg counties this season, One photographed by Matt Campbell on Main & Beulah Streets, Due West, 4 September was a county record for the under surveyed Abbeville Co. Intricate Satyr: Besides records 2-24 June and 6 October for the known population at Roxbury Park reported by Tom Austin, Marty and Dave Kastner photographed 3 on 22 September at Childsbury Towne Heritage Preserve for a Berkeley Co. record which fills in a gap in this species South Carolina range. Queen: Tom Austin had Queens for several days in late June at Roxbury Park, Meggett and 1 was seen during the count week for the Hobcaw Barony NABA Count (1 September). Long-tailed Skipper: Matt Campbell photographed an individual at Erskine College 15 October and 1 17 October on Paige Rd near Honea Path for an Abbeville and Anderson Co. record respectively, This leaves only Cherokee and Marlboro counties without records for this species. Mottled Duskywing: Always a good find was 1 photographed by Dennis Forsythe 7 August on Cedar Creek (FS 744c) Rd, a known location in the Oconee Co. section of the Andrew Pickens District, Sumter NF. Common Sootywing: Donna and Dennis Forsythe had 2 on Bethel Forest Rd, Orangeburg Co. on 22 July (a known location); Dennis Forsythe had 1 at Holy Cross Cemetery, James Island 9 October (a new location) and Will Cook had 1 on 6 June along a forest road in the Union Co. section, Enoree District, Sumter NF (a county record). Byssus Skipper: Will Cook had a Byssus Skipper 2 August, near the Galilee Baptist Church, in the Union Co. section of the Enoree District, Sumter NF. This is not only a Union County record but it nicely fills the gap in this species SC distribution. Reversed Roadside-Skipper: Three photographed by Dennis Forsythe on Cedar Creek (FS 744c) Rd in the Oconee Co. section of the Andrew Pickens District, Sumter NF were noteworthy. This known location is away from the better know Francis Marion NF locations. Brazilian Skipper: The strong movement of Brazilian Skippers in South Carolina first noted this spring continued unabated through to this autumn. I have seen more adult Brazilian Skippers this year than I have in the past 10 years. There were reports from at least 10 counties this season. Counties where this species was known include: Aiken (John Demko), Charleston (many observers), Calhoun (Donna and Dennis Forsythe), Georgetown (Dennis Forsythe) and Jasper (many observers). New country records included: Greenwood (Rusty Wilson), Greenville (Robert Barnett), Lancaster (Carolyn Seaton), Oconee (Dennis Forsythe) and Spartanburg (Dennis Forsythe).